We have a Italian sauce issue at my house. I love homemade, but my boys think the jarred is better. Go figure. This meant that I was a little worried about trying out Bertolli (which I've not had before), but I thought it would be worth a try. 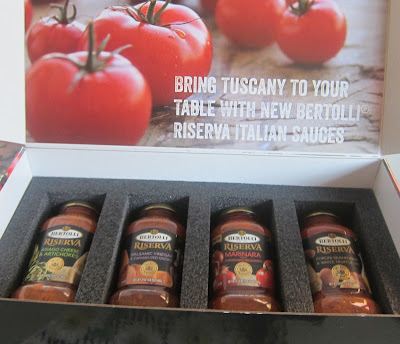 They would send out the beautiful box of their 150th birthday gourmet sauces, and I might or might not find a sauce from a jar that I enjoyed serving and eating. 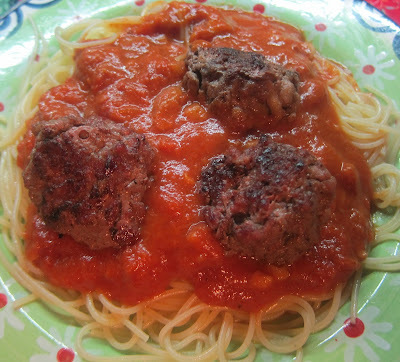 I decided to go Italian on the Weber Grill with the sauce heated and meatballs smoked. It was hard to select the first sauce to try, but I liked the sound of Porcini Mushroom with White Truffle Oil. It is possible to do the noodles on the grill. You have to hit a boil and then maintain the heat. It's easier on a gas sideburner though many of those do not put out enough heat. Over charcoal can hit the needed temperatures, but it's hard to keep heat even. A good thick, pot is good for holding the heat. Since I was not out in the great outdoors, I did my pasta on the stove. It's much easier, so I'd say do that on the stove, unless you are out camping or something. 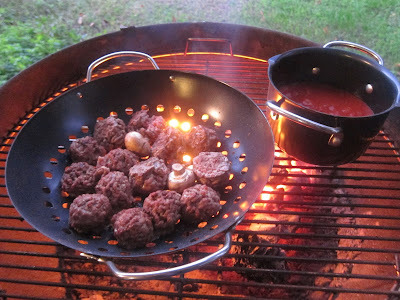 I did heat the marinara sauce over charcoal to add a little smoke flavor and also grilled meatballs with mushrooms. Yum. I was very pleasantly surprised at how good the sauce tasted. The smoke added a nice note, but the basic sauce was excellent. My boys can tell you that I've never said that about any sauce in a jar. I might eat it to humor them, but I don't have to like it. This sauce, I did like as much or more than my own. I'm glad Bertolli got in touch about their new celebration sauces. I wasn't really sure that I could ever eat sauce from a jar and love it, but that is how I feel about this red sauce. I will be buying Bertolli, and I'm thankful to have found a sauce that I really enjoy. Recipe sounds great. Never considered cooking meatballs on the grill. I will let you know. The smoke flavor is really nice from the charcoal or wood.